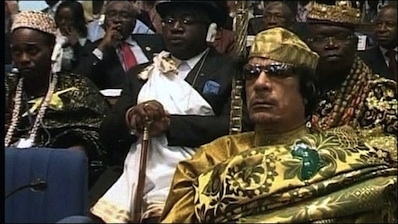 Western intervention in Libya helped topple the 42-year rule of dictator Mu'ammar al-Qaddafi, seen here at the African Union meeting in February 2009, but it seems to have done so at the expense of the Libyan nation-state and surrounding nations of the Maghreb and north-central Africa. The overthrow of Libya's long-reigning dictator Mu'ammar al-Qaddafi by an international coalition in the summer and autumn of 2011was hailed at the time as paving the way for a "New Libya." Instead, the country rapidly slid into widespread anarchy and violence as a kaleidoscope of tribal, ethnic, religious, political, economic, ideological, and regional interests, powerfully suppressed by the fallen regime, tore the country apart. Nor has the violent chaos stopped at Libya's borders. With groups tied to the global jihadist community stepping into the fray in strength, political-religious militancy and a sea of sophisticated weaponry has spilled over to Libya's African and Arab neighbors, with dramatic implications for Europe as well. Anti-Western terrorist organizations affiliated with the global jihadist community have been the chief beneficiaries of the turmoil, destabilizing bordering areas and, in turn, injecting strong doses of belligerence and terror back into Libya. Escalating fighting, rampant lawlessness, and a power vacuum have turned Libya into an attractive arena for the aspirations of the Islamic State (IS), which by late 2014 to early 2015 had established a power-base in the country's eastern and central areas. The collapsing Libyan state has become a textbook example of the law of unintended consequences. A review of how things fell apart—and what challenges lie ahead—may thus offer clues for how to approach similar situations. Throughout the spring of 2011, a coalition of Western non-ground forces and Libyan rebels scored a series of military successes against Qaddafi and his loyalists. Rebels advanced westward from eastern Libya along the Mediterranean coast in an effort to seize the oil and gas fields, refineries, and export terminals and to inflict a fatal blow to the regime's power-center in Tripoli. By that point, there were growing cracks within the top political and military leadership of the Qaddafi regime. Eight thousand soldiers had already deserted during the initial phase of the uprising, including forces associated with the Zintan tribal group of the western mountainous regions. Musa Kusa, Libya's foreign minister and a Qaddafi confidant, had already defected in March. As of June 2011, the Libyan military "had shrunk to somewhere between 10,000 and 20,000 (from its original 51,000)," yet the Western-rebel military coalition was unable to achieve a decisive victory. 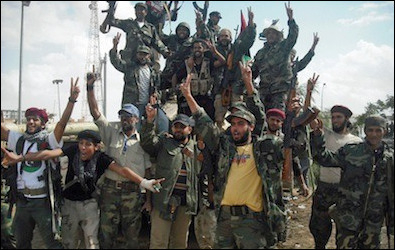 Militia members celebrate a victory. In the absence of any effective central authority, an estimated several hundred militias in 2012 had grown to approximately 1,700 by early 2015. Funds from various sources, such as the Muslim Brotherhood-affiliated "Libya Shield Force," have enhanced their recruitment potential and diminished the power and effectiveness of the national army. This changed in early June when U.S., British, and French forces initiated air attacks on targets in built-up urban areas. The devastating impact on Qaddafi's army was soon apparent despite its reinforcement by devoted Sahelian Tuareg soldiers mainly from Mali, who fought fearlessly for "Brother Leader" as well as for their own survival. In early August, NATO stepped up its military pressure, concentrating its air assaults on the area surrounding Tripoli and paving the way for the rebels to storm the capital later that month. On October 20, 2011, Qaddafi was captured and executed by the rebel militia of Misrata, a city on the Gulf of Sirte. Three days later, the National Transitional Council (NTC), the representative organ of authority established earlier that year by the rebels and, at that point, recognized by most countries as Libya's government, formally proclaimed the country's liberation. It was both "the end and a beginning," opined one writer, but what kind of beginning soon became abundantly clear. Soon after the regime's collapse, Libya was further wracked by turmoil and chaos, unprecedented in scope since gaining independence in 1951. The elimination of Qaddafi's iron grip, which had held together the diverse and often contentious elements of the fragmented Libyan society, unleashed with volcanic force the long-restrained effects of cruel political-religious oppression, chronic economic neglect and deprivation, and social and tribal marginalization. Alongside these long-repressed rivalries, there were the additional stresses to the state's formal, yet weak, institutions of governance in the form of secessionist threats to Libya's territorial integrity in Cyrenaica in the east and, to a lesser extent, in Fezzan, the southern region. What economic opportunity existed was shattered by the sharp decline in oil and gas exports, which had been practically the sole source of foreign currency. The NTC and forces allied with it were no match for the violent power struggles taking place among rival armed militias, nor could they do anything to stand up to the empowerment of a large-scale criminal economy based on illegal trafficking of drugs, migrants, and arms, which affected the security of Libya as well as Africa and the Middle East. The Western nations had no stomach for nation-building in the wake of their traumatic experiences in Afghanistan and Iraq. Deliberately staying aloof from the nascent anarchy, they watched as Libya descended into the all-too-familiar pattern of a failed military intervention, with the nation turning into a cauldron of jihadist fanaticism and domestic and regional strife. The ex-rebel forces and other armed militias took advantage of the newly created power vacuum to promote their political and religious aspirations and, at the same time, redress their chronically socioeconomic grievances. It was not long before these groups amassed enough strength to become the dominant players on the Libyan stage and a threat to the new state's fragile organs of authority. Moreover, the militias' connections with a wide gallery of regional and international players also redrew the map of the country's foreign relations, which in turn, played a crucial role in exacerbating the fighting and in accelerating Libya's plunge into the abyss. The numbers tell it all. In the absence of any effective central authority, by early 2013 an estimated several hundred militias operating in the immediate wake of the intervention had grown to approximately 1,700. Funds from various Libyan and non-Libyan sources bolstered both the militias' prestige and financial solvency, enhancing their recruitment potential and further widening the gap between their power and that of the ineffective national army. For example, the Islamist-affiliated Libya Shield Force, operating in Benghazi under the command of warlord Wissam Bin Hamid, received funding from the powerful Islamist bloc within the General National Congress (GNC), Libya's parliament and successor to the NTC following elections in June 2012. Within the chaotic landscape of multiple rival armed forces, the clash between the Misrata and the Zintan militias stands out as a major catalyst to the dissolution of the state. These two groups initially developed a tactical alliance during the 2011 uprising against Qaddafi. Prior to that, the people of the city of Zintan, about 140 kilometers southwest of the capital, had been traditionally linked by kinship bonds to the Warfalla, Libya's largest Bedouin tribal group, which together with the Maqarha tribe and the dictator's own Qaddafa clan composed the regime's backbone. As noted however, Zintan soldiers from the state army defected en masse in 2011, regrouping with the anti-Qaddafi coalition of urban coastal tribes, including rebels from the Misrata. This Western-backed alliance ultimately crushed the regime's last bastion in the capital: Qaddafi was captured and executed by Misrata militiamen while Zintan irregulars played a similarly significant role in extracting Saif al-Islam, Qaddafi's son and right-hand man, from his hiding place in November 2011 and holding him prisoner, despite persistent NTC demands to surrender him. (In late July 2015, still in the hands of the Zintan militia, a court in Tripoli sentenced Saif al-Islam to death in absentia). The Misrata camp was closely affiliated with Islamist groups; the Zintan affiliated with the more secularist and nationalist groups. It was hardly surprising, therefore, that each militia, controlling substantial arsenals of weapons, perceived itself as having the right to reshape the state. By mid-November 2013, their alliance had collapsed. The trigger was a demonstration in Tripoli by the Zintan militia, viewed by the Misrata as a provocation. In response, Misrata militiamen opened fire on the demonstrators, killing forty and wounding 150. These armed hostilities were intertwined with fierce political tensions as both militias expanded their respective coalitions. At one end of the reinvigorated conflict stood the Misrata camp, which was closely affiliated with Islamist groups politically active in the General National Congress, most notably the Muslim Brotherhood. At the other end, stood the Zintan camp affiliated with the more secularist and nationalist National Forces Alliance (NFA) that had gained a slight majority in the 2012 GNC elections. Both militias, however, used whatever legal or illegal measures at their disposal to gain the upper hand. Soon the GNC itself became irrelevant. Due to a lack of financial resources, the state had no ability to recruit and build effective defense and security organs, certainly in comparison to the militias. In the ensuing chaos, there were frequent abductions and assassinations of politicians, policemen, military commanders, soldiers, judges, human rights activists, journalists, and foreign diplomats. Main road intersections, police stations, and government buildings came under attack. People were imprisoned in clandestine detention centers run by the militias, and the militias attacked state prisons, releasing both criminals and political prisoners affiliated with them. Even Prime Minister Ali Zeidan was briefly abducted in October 2013 after a failed no-confidence vote against him in the parliament; by spring 2014, he had fled the country. Contemporary Libya is less a nation than a geographical construct populated by competing and often interlocking tribes and clans. The Zintan (here Zentan) of the western regions and the Misrata (here Misurata) are perhaps the most prominent today locked in a deadly battle for control of the country and its resources. The General National Congress's decision to remain in office until December 24, 2014, instead of ending its session earlier as scheduled, further exacerbated the state's break up. Elections to a new GNC, in fact, the government, were eventually held in June 2014, but its first sitting took place two months later in the port city of Tobruk on the country's eastern Mediterranean coast, intentionally far from the capital where Islamists had refused to dissolve the existing government, insisting on its legitimacy. The Tobruk-based government—internationally recognized as the exclusively legitimate one—was supported by Zintan militias and their allies while Islamist-affiliated Misrata militias and their respective supporters backed the one in Tripoli. As one commentator put it: "What was one single weak regime has now turned into two regimes, each of which claims legitimacy for itself and denies it to the other." Further military unrest accompanied this political turmoil. In May 2014, Operation Dignity was launched by a newly established national army under the command of former army general Khalifa Haftar, who had defected from Qaddafi's army as early as 1987. Haftar's ambitious campaign was aimed at "cleansing" eastern Libya and, particularly, Benghazi and Derna of its Islamist and jihadist groups and at generating sweeping changes in the state's top political organs on behalf of the anti-Islamist camp. The Islamist militias in eastern Libya responded by forming a tactical alliance, declaring jihad against the "infidel" opponents. The Islamist alliance included the Ansar al-Shari'a Brigade, infamous for its role in the September 2012 attack on the U.S. consulate in Benghazi. Unfortunately for Haftar and his supporters, Operation Dignity failed to produce the desired results. The militias of eastern Libya were fiercely motivated by their religious vision, their long-harbored secessionist aspirations, and their claims on oil resources. Moreover, renewed fighting in Tripoli gnawed at the resources available to Haftar's war in the east. Regional and international involvement in Libya peaked in late August 2014. The Tripoli government backed by the Islamist Misrata forces maintained ties with Qatar, Turkey, and Sudan, which provided them with political, financial, and military support. They also received support from Libya's former grand mufti, Sadiq Ghariani, who, from the comfort of his refuge in Britain, used an Internet channel to urge Islamist forces to widen their anti-government revolt in a "Libya Dawn" campaign in Tripoli. The rival Tobruk-based government, backed by the Zintan camp, was backed by Algeria, Saudi Arabia, the United Arab Emirates (UAE), Egypt, France, and other Western states. France was especially concerned with the potential spillover of Libyan chaos and terror into its former colonies in the Sahel and the Maghreb, including Mali, Niger, and Algeria, where it had strategic, military, and other interests. By early 2015, fighters from the Islamic State had established beachheads in centrally-located Sirte and in Derna (pictured here) in eastern Libya for the new caliphate that they envisioned. In an effort to promote its expansionist and jihadist goals aggressively, the group launched a series of terrorist attacks, including the horrific beheading of twenty-one abducted Egyptian Copts. Providing a further twist on foreign involvement, mysterious air attacks struck Misrata-held sites in Tripoli during the second half of August 2014. Many believe them to have been Egyptian aircraft supported by planes from the UAE while others implicated Tunisia, Italy, and Belarus. Whatever the bombers' identity, the battles between the two political and military camps over control of the country exacted a heavy toll on the civilian population. In the end, however, Misrata forces claimed victory signaled by their control over Tripoli International Airport and effective command over air traffic to, from, and within Libya. 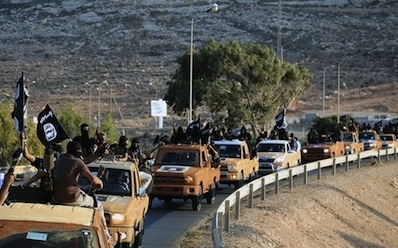 By late 2014, a new belligerent actor had entered the scene—the Islamic State (IS, or ISIS as it was previously known)—which quickly began to establish beachheads in Derna and Benghazi in eastern Libya and in centrally-located Sirte for the new caliphate that it envisioned. Soon the Sirte branch of the Ansar al-Shari'a militia had pledged its allegiance to the newcomer as did the former dictator's own tribe, the Qaddafa. In an effort to promote its expansionist and jihadist goals, the Libya-based IS launched a series of terrorist and military attacks, including one on the Mabruk and Ghani oil fields in the first half of 2015 in tandem with the horrific beheading of twenty-one abducted Egyptian Copts as well as of Ethiopian and Eritrean Christians captured while crossing through Libya's territory in their illegal migration toward the shores of Europe. There could be little doubt now that Libya had turned into a failed state where competing domestic and international parties, notably the Islamic State, used their positions to exact bloody revenge and seek further aggrandizement. The Libyan state has been characterized in the non-Libyan media as a "pestilential swamp" where the state and its society "have gone beyond the point of no return in its precipitous slide into civil war." Libya turned into a failed state where competing parties used their positions to exact bloody revenge and seek further aggrandizement. Calls by the Tobruk-based government for "international intervention" by the U.N. Security Council have gone unheeded yet prompted the hard line, Tripoli-based, Islamist bloc and its jihadist allies to unequivocally reject "any measure that would bring foreign troops onto Libyan soil." Writing in the Los Angeles Times, former U.S. diplomat Mieczyslaw Boduszynski and Middle East expert Kristin Fabbe described the two conflicting militias as both "a cause and a consequence of state weakness." Shortly after this observation was made, the Islamic State took many observers by surprise by its rapid consolidation of power in Libya and the attendant change of both the country's political, religious, and military map and its immediate geostrategic environment. 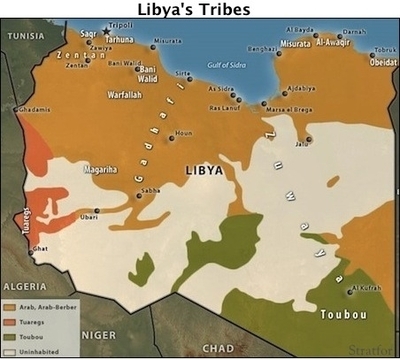 There are effectively four main state, sub-state, and non-state local and foreign actors, most of them heterogynous and inconsistent in their affiliation, vying for control of Libya and its economic resources while changing the country's territorial map. These are the Tobruk government backed by the Zintan militia, the Tripoli government backed by the Misrata militia, the IS in Libya, and a broad and diverse coalition of local and foreign non-state groups, including non-Libyan rival jihadist groups fighting alongside their Libyan political and ideological camps. The self-proclaimed Islamic State, including its Libyan offshoot, inebriated by rapid successes, has even launched a social media campaign on Twitter to mobilize supporters from outside the state to "immigrate to Libya [to] guarantee your place in the gateway of the conquest of Rome." It is no accident that the Libya of 2015 is frequently awarded the dubious title of the "True Somalia" or the "Somalia of the Middle East." By rushing heedlessly into battle in 2011 with no clear, long-term strategy, the Western powers have helped create a Frankenstein monster out of the corpse of Libya, a creature that may before long wage jihad against both Europe and the Middle East. Yehudit Ronen is a professor in the department of political studies, Bar-Ilan University. Her research focuses on Libya, Sudan, and the Sahel seam-line between the Arab and African worlds. Florence Gaub, "The Libyan Armed Forces between Coup-proofing and Repression," The Journal of Strategic Studies, 2 (2013): 233, 235. Ethan Chorin, Exit Qaddafi (London: Saqi, 2012), p. 253. For Libya's ethnic fabric, see Youssef Sawani and Jason Pack, "Libyan Constitutionality and Sovereignty Post-Qaddafi: The Islamist, Regionalist, and Amazigh Challenges," The Journal of North African Studies, 4 (2013): 536-40; for the growing sectarianism, see Daniel Byman, "Sectarianism Afflicts the New Middle East," Survival, 1 (2014): 79-100. More specifically, Mali, Algeria, Chad, Sudan, Nigeria, Lebanon, Syria, Egypt, the Sinai Peninsula, and the Gaza Strip. Gaub, "The Libyan Armed Forces between Coup-proofing and Repression," p. 238; Farouk Chothia, "Why Is Libya Lawless?" BBC News (London), Jan. 27, 2015. Asharq al-Awsat (London), Aug. 6, 2014. Gilbert Achcar, The People Want: A Radical Exploration of the Arab Uprising (London: Saqi, 2013), p. 202. Al-Ahram Weekly (Cairo), July 24-30, 2014. See Karim Mezran, "What Is Going on in Libya?" Al-Jazeera TV (Doha), July 31, 2014. Muhammad Kureishan, "Sliding towards the Abyss in Libya," al-Quds al-Arabi (London), quoted in Mideast Mirror (London), Aug. 28, 2014. Khaled Hanafi, "Unpicking the Haftar Drive," al-Ahram Weekly, June 5-11, 2014. BBC News (London), June 13, 2014. Mohannad Obeid, "What's Happening in Libya?" al-Akhbar (Beirut), Aug. 26, 2014; al-Arabiya News Channel (Dubai), Sept. 2, 2014; Sudan Tribune (Khartoum), Sept. 6, 2014. The Guardian (London), Aug. 31, 2014. Andrew McGregor, "Egypt, the UAE and Arab Military Intervention," Terrorism Monitor, Jamestown Foundation, Washington, D.C., Sept. 5, 2014. Al-Ahram Weekly, Aug. 21-27, 2014. Ibid. ; Abdullah al-Bakoush, in al-Ahram Weekly, Aug. 14-20, 2014. RT network (London), Aug. 13, 2014. Mieczyslaw P. Boduszynski and Kristin Fabbe, "What Libya's militia problem means for the Middle East and the U.S.," Los Angeles Times, Sept. 23, 2014. "ISIS Recruitment Campaign on Twitter," Jihad and Terrorism Threat Monitor, The Middle East Media Research Institute (MEMRI), Washington, D.C., Feb. 16, 2015. See, for example, Maha Sultan in Tishrin (Damascus), quoted in Mideast Mirror, Nov. 18, 2013. Related Topics: Libya, US policy | Yehudit Ronen | Winter 2016 MEQ receive the latest by email: subscribe to the free mef mailing list This text may be reposted or forwarded so long as it is presented as an integral whole with complete and accurate information provided about its author, date, place of publication, and original URL.